(VEN) - By August 2015, investors from Association of South East Asian Nations (ASEAN) countries have invested in Dong Nai through 129 projects with total capital of over US$3.42 billion, focusing on real estate, industrial production, and agriculture. Singapore currently takes the lead among ASEAN countries investing in Dong Nai, with 49 projects worth nearly US$2 billion, 42 of which are based in industrial zones. The largest Singaporean investment project in Dong Nai is an urban development and hotel project in Bien Hoa city’s Long Hung Commune valued at US$750 million. The second largest project is also in the real estate sector, Hoa Sen Dai Phuoc, in Nhon Trach District’s Dai Phuc Commune, with total investment of US$400 million. Thailand is the second largest ASEAN investor in Dong Nai. Following successful investment in the Amata Bien Hoa Industrial Park, the Amata Group recently announced its investment in the Long Thanh High-tech Park with total capital of US$282 million. The construction of infrastructure for the high-tech park is expected to begin between mid-2016 and early 2017. The Long Thanh High-tech Park will help Da Nang attract investment from Thailand, the Republic of Korea, and Singapore in fields such as biotechnology, nanotechnology, and pharmaceuticals. 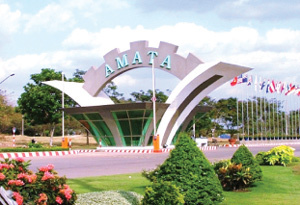 The Amata Group is also preparing for investment in a 753ha urban service area in Long Thanh District’s Tam An Commune, and another urban service area to cover 122ha in Tam An and Tam Phuoc communes. Total investment in the two areas is nearly US$250 million. Amata Vietnam General Director Somhatai Panichewa said, “We have successfully invested in Dong Nai. The ASEAN Economic Community (AEC) will be established later this year and we hope the Trans-Pacific Partnership (TPP) and the EU-Vietnam Free Trade Agreement will be signed in the near future to create opportunities for Vietnam as well as for our group to attract investment, especially in high technology. Many other Thai businesses also want to invest in Vietnam and Dong Nai in particular. Thai investors are interested in a number of large transport infrastructure projects in southern Vietnam such as the Long Thanh-Dau Giay Highway, Long Thanh International Airport, and deepwater seaports in Cai Mep-Thi Vai (Ba Ria-Vung Tau Province). According to Dong Nai Province People’s Committee Vice Chairman Nguyen Phu Cuong, many businesses from ASEAN member countries have come to Dong Nai to seek investment opportunities. When the AEC is established, the province expects it will attract more investors from ASEAN countries. According to the Foreign Investment Agency under the Ministry of Planning and Investment, ASEAN is a large investment partner for Vietnam with 2,632 ongoing projects with total registered capital of US$54.6 billion. The average amount of investment in each project from ASEAN is US$20.7 million, 1.5 times higher compared with the average amount of investment in foreign invested projects.